Use of genetically modified constituents for processed food will soon have to be mentioned on labels. A gazette notification from the Ministry of Consumer Affairsmakes it mandatory for packaged foods using genetically modified products as ingredients to carry such labels from January 1, 2013. The notification was out on June 5, 2012. Though this step is supposed to help consumers in making informed choice and checking the illegal entry of GM food into Indian market, its efficacy is being questioned. “Majority of food consumed in India is unpackaged and there are still no waysfor people to know whether it is genetically modified or not,” said Kavitha Kuruganti of Alliance for Sustainable & Holistic Agriculture (ASHA), a non-profit based in Bangalore. "While labeling does give consumers a chance for avoiding genetically modified food in the market, what our Government seems to forget is that it is almost impractical in India where more than 90 per cent of our food is unprocessed and non-packaged and forms a chunk of the unorganized sector,” said Shivani Shah, campaigner, Sustainable Agriculture, Greenpeace. This notification fails to look at the other aspect of GM crops— the impact on human health and environment through open field trials. “It is impossible to stop contamination from open field trials of GM crops that are being permitted in our country. The best way to ensure consumer sovereignty is to take a precautionary measure and stop any environmental release of potentially risky GM crops,” Shah added. What is of greater concern is that the Food Safety and Standards Authority of India (FSSAI) that should be looking into GM labeling have kept quiet for most part. In an RTI response, filed by Greenpeace, the FSSAI under the Ministry of Health and family welfare, which is the nodal agency for labeling of GM food, had said that it is not looking after the labeling of GM food. In its response letter it was said that Genetic Engineering Appraisal Committee (GEAC) under the Ministry of Environment and Forests, which is the nodal agency for any environmental release of GM crops, is responsible. And the GEAC in a RTI response at about the same period said the opposite, putting FSSAI as the agency in charge of labeling rules. The environmental and health impacts of genetically modified foods have been debated all over the world in the last few years. A report on by Earth Open Source, a non profit based in London in June 2012 pointed out the risks involved with cultivation and consumption of GM crops. The report showed how the methods of genetic engineering are unpredictable in their outcome and may induce toxicity and allergenicity. (See Myths and Truths of GM food). The labeling norms for GM foods vary all over the world. In the EU it has been made mandatory since 1997 to label all GM food products. In the US,however, where a huge percentage of food products are derived from genetically modified crops, they are yet to adopt stringent labeling norms for GM foods. 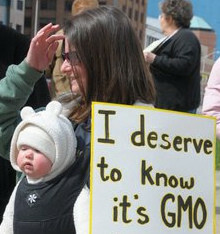 There is a growing demand in the US to label GM food.